How Long is Long Term in Investing? As investors, we are taught to try and think long term. The story goes something like this — invest in stocks, stay disciplined and patient and let your money compound over many years or even decades and you can growth your wealth. 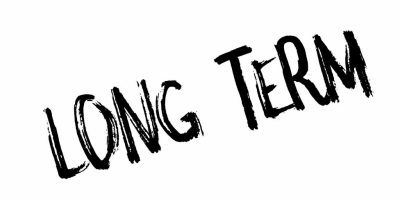 I strongly believe in that story, but the reality is for many investors the definition of “long-term” becomes too narrow and time focused. When thinking about long term investing, timeframe is not the only factor you consider. One of the reasons stock market investors need to think about investing as a long term activity is because the data shows that the longer your time horizon the better your chances of positive returns. The chart below is as of 2015, but the figures show an important investing lesson. 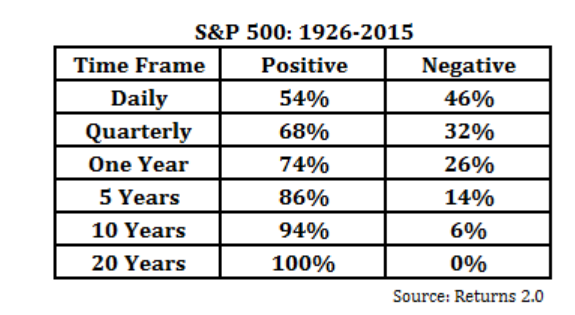 The longer your time horizon the better your chances are of having a positive return in the markets. Over a 10 year period in the market, there has been a 94% chance of generating a positive return and over all 20 year periods the return has been positive. Contrast that with any one year, and there’s a one in four chance you can lose money. The chart above tells you the probabilities of generating a positive return, but it doesn’t tell you the range of returns. For example, the S&P 500 has returned, on average, 9.2% over all rolling 10 year periods going back historically. Averages are one thing, but in the stock market the averages mask the variability of returns. The best 10 year period for the market saw a compounded annual return of 21.2%, while the worst 10 year period saw an annualized return of -4%. As the time horizon shortens, say to three or five years, the maximum and minimum returns experience much more variability, which is another reason to always have a time frame of multiple years when investing in equities. To illustrate how much returns can vary, let’s take three investors. Investor 1 invests in the S&P at the start of 2000 at the height of the dot com and technology bubble. Over the next 9 years, which included two very bad bear markets, that investor sees a -3.7% annualized return. The second investor starts investing at the beginning of 2009, which turns out to be a great time to get into stocks. From 2009 to the end of 2017, the annual compounded return of the S&P 500 was 15.3%. The third investor invested in 2000 and stays invested in the S&P through 2017. That investor generated a return of 5.4%. All figures include dividends. The example above may be an extreme one as it takes a very bad period for stocks and compares it to a very good period for stocks, but the example ties back to the question about how long the long term really is in investing. Long term investing not only needs to be thought about in terms of time horizon but also in terms of the environment you have invested in and how that has impacted returns. An investor who invested in 2000 and had losses 9 years later shouldn’t have given up on stocks, as difficult as it may have been, but instead tried to understand the period was bookended by two bear markets and that the chances for strong returns following such a bad period, based on historical precedent, were very high. 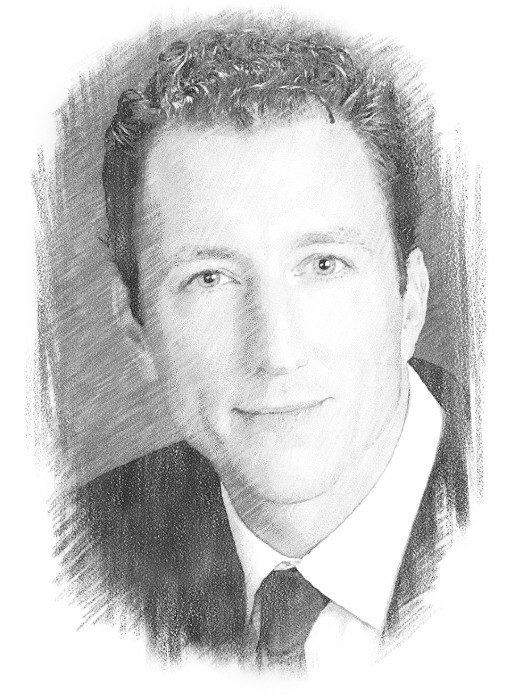 This concept — the coupling of time horizon with an understanding of the environment you have invested in — flows down to many parts of the market and into quantitative investment strategies themselves. 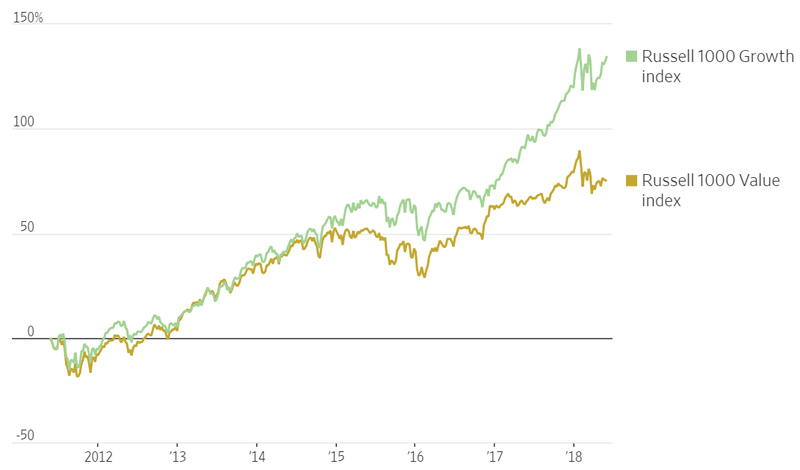 If you were an investor who believes in overweighting value stocks and put money into the Russell 1000 Value index, a large cap value portfolio, you’d be up around 75% since 2011. That is good, but not nearly as good as the Russell 1000 Growth index, which is up about 135%. Many investors following a value approach may conclude that they’ve given value investing a long enough time (i.e. 7 years) to show strong returns and outperformance over the market, but I would argue that is not enough time because 1) the environment we have been in has not rewarded value stocks vs. other types of growth and momentum stocks and 2) history shows that value stock outperformance is cyclical and there are periods when it works and long periods when it doesn’t work. Of course, staying invested in the market or with a manager and seeing years and years of below average returns isn’t easy, and all investors have a different threshold for how long they can stomach losses or underperformance. But it’s important to look at the returns in the context of the overall investing environment and not based on some set time horizon like 3 or 5 years. Coupling time invested with an understanding of the environment you’ve invested in is a good approach that will lead to the best investing outcomes going forward.